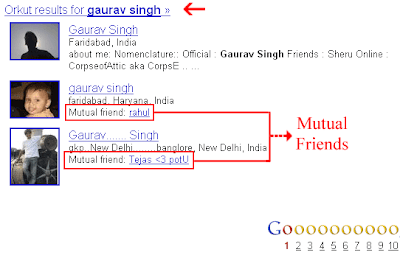 Yes its true, Orkut profiles have started to show up on Google Searches. There had been a option for them to be enabled or disabled since a longtime in orkut settings, but no results were found on Google. But now the results have started to appear for the same. The feature allows you to view people in your Orkut network in your google search results if you search for some relevant keyword, like someone's name or so. The results are not Visible to all, they are visible only on Firefox as of now(Firefox 3 in my case) and only when you are signed into Google Toolbar or Orkut. Searching for the very particular terms on Opera 9.5 and Internet Explorer 7 , yielded no such results. This means Google and Orkut are more integrated with Firefox than other browsers. >> This is a good feature but the only stinging point is why this isn't implemented with other browsers? Also remember that this feature would only show the people in your Orkut network and not everybody, keeping in mind the privacy aspect.